In September, 2003, with talent, conviction, and enthusiasm, Mia Hall Miller (Savage) and a small team of dedicated musicians started two youth choirs: one for elite treble singers and one for high school students. From the beginning, PYC has been a fully functioning non-profit organization under the governance of a hard-working board and an illustrious honorary board. Within weeks of the first rehearsal, the original two choirs doubled in size and voice to become four choirs. 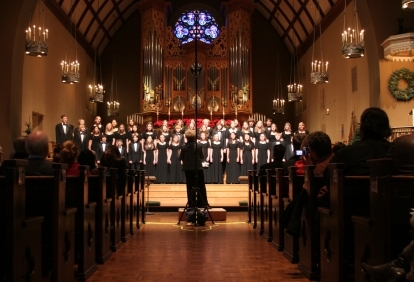 Pacific Youth Choir immediately found a home as Choir in Residence at Portland’s Trinity Episcopal Cathedral. And by the end of the first season, five choirs were in place, with 120 voices and singers ranging in age from eight to 18. Now in its sixteenth season, PYC remains true to its core values and artistic goals: to connect every singer in every choir to a higher awareness of life through music—touching choristers’ lives in positive ways that they take back to their families and communities. The atmosphere is collaborative, joyful, and disciplined. Committed, focused work leads to true accomplishment. Developmentally appropriate musical and choral challenges keep pace with the singers as their skills mature throughout each choir year. With more than 280 students representing over 60 Portland metro area schools, Pacific Youth Choir is widely acclaimed as one of the finest choral programs on the West Coast. Pacific Youth Choir changes lives through high level choral artistry in an open, joyful, and nurturing environment. Through practice, performance, and education singers build their skills and emerge as confident young adults with a lifelong love of music. PYC strives to inspire audiences as they work together to create musical excellence.